So holy crap y’all, its September. I really have no idea where the summer went, and while it won’t cool off here for a few more weeks I am both hanging on to the last of summer and totally ready to jump into fall, particularly fall food. The hubs is rather partial to spaghetti and meatballs so I decided to throw a Tasty Belly twist on it so it would be a bit lighter and summery. 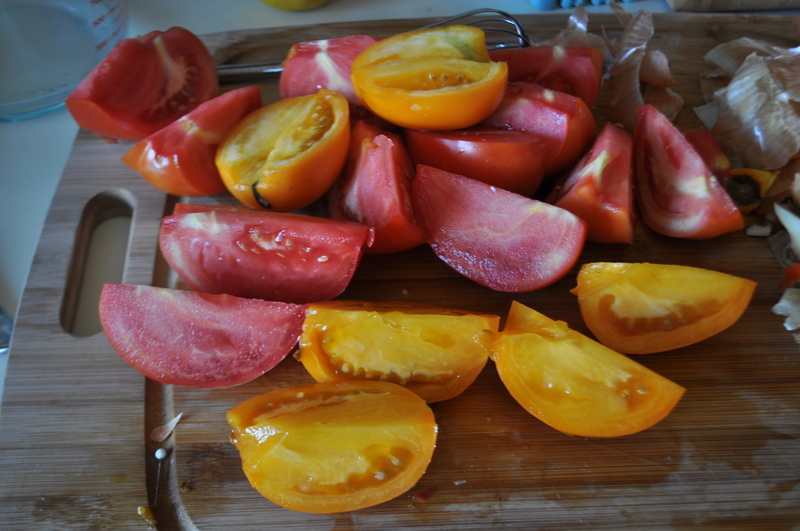 I made my standard fresh tomato sauce, cooking wedges of heirloom tomatoes in a pan until they were soft enough to be crushed down by my potato ricer. 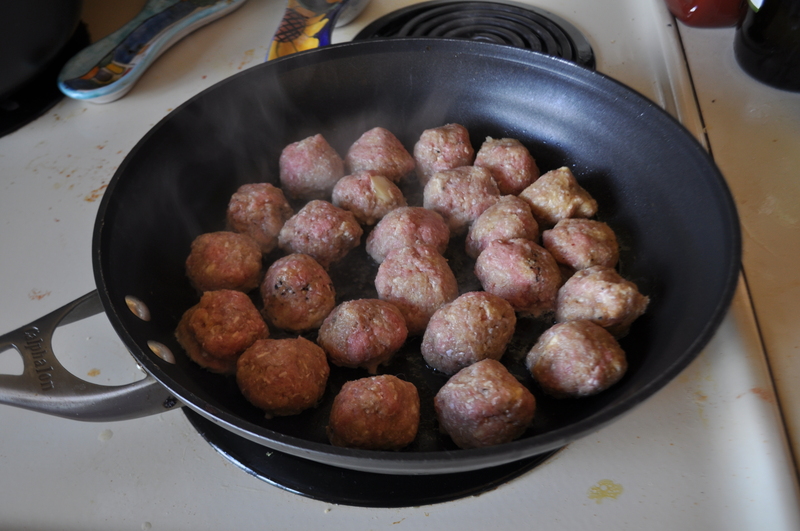 Once I had macerated 4 pounds of tomatoes I moved on to the meatballs. 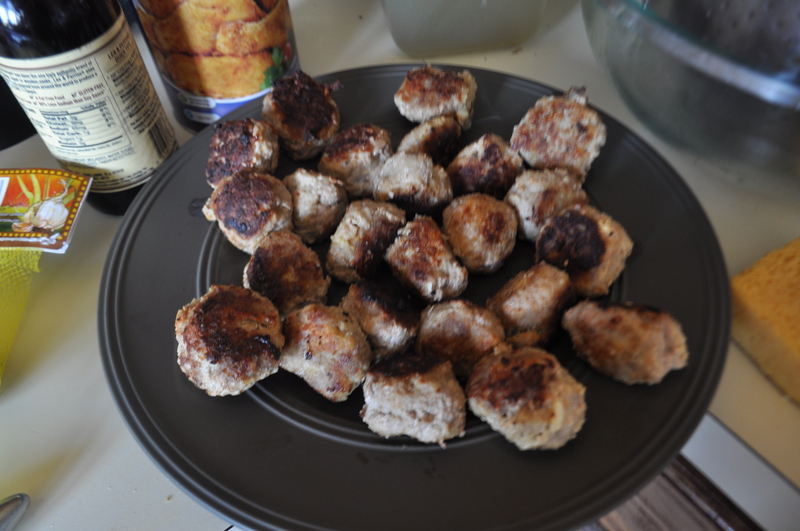 I mixed all of that together and rolled it into meatballs about 1 inch in diameter. 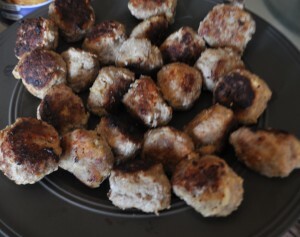 Then I browned them on all sides, or best you can as they are round. 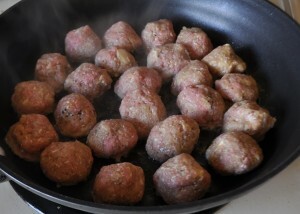 Then I moved the meatballs onto a plate so they could cool and I could use the yummy juices to start the sauce. I deglazed the pan with some red wine I had leftover from dinner the night before (white would work just as well), to that I added a thinly sliced shallot and three minced cloves of garlic. 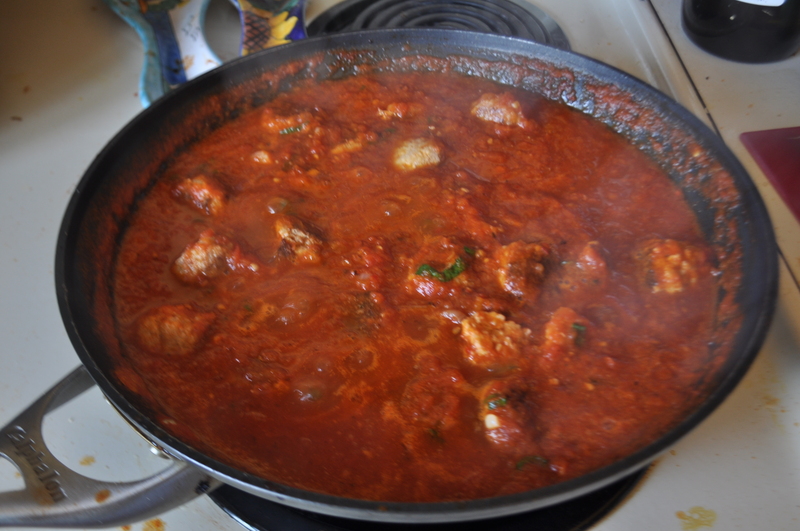 Once that has cooked for 3ish minutes I added the crushed tomatoes and let that come to a boil, as I wanted a thick sauce so I needed to get rid of some of the water in the tomatoes. Once the sauce was up to boil I added 2 tablespoons of garlic powder, 2 tablespoons of crushed red pepper, and salt to taste (I like things less salty plus I planned to put A LOT of parmesan reggiano on top of my pasta). 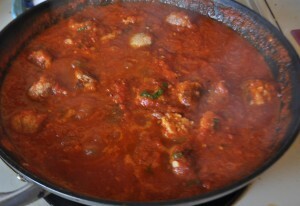 Then I added the meatballs back in and let it bubble away for about another half an hour. While it would have been so much more delicious if I had let it sit overnight I am far too impatient for that. Instead I covered the sauce and let it sit on the stove for about 4 hours till I reheated it and served it over papperdelle. It was the perfect way to get the delicious flavor of summer tomatoes with hearty meatballs to get us ready for fall food!